Cisco and Estarta Solutions back again for the 2nd annual g4g Day in Amman, Jordan! This year the girls enjoyed tons of Technology workshops including programming, an hour of code, a treasure hunt network and innovating with the internet of everything! On top of that, fun science workshops include making your own lip balm, mathematical shapes & theories, fun with electricity and DNA extraction! Best Captures: Click here to view the FULL ALBUM! "When you have a dream, follow it" - Aurelia Takacs. Read her blog on Launching g4g in Jordan: the sky is the limit! Meet the g4g Jordan Team! Aurelia Takacs is on our advisory board for corporate partnerships and is our diversity & inclusion expert, global Cisco contact, AND Project Manager for g4g in Amman & Krakow! She’s piloted our‘g4g@work’ concept w/ Cisco, which we will use with other companies around the world! As a “world citizen” in Brussels, she loves kitchen science and watching "The IT Crowd"! She hopes to inspire girls to think “outside of the box” and study and pursue careers in STEM. All about her launch in Jordan here! Rania Halabi is one of our Project Coordinators for g4g Jordan. She is a computer engineer and now a Senior engineer at Estarta-Cisco TAC. She loves being around young people, and enjoy volunteer work, especially discovering the strength in young people. She enjoys working in the networking field, considering network issues a puzzle needing to be solved. Rana Itani, one of our Project Coordinators for g4g Jordan, is an Industrial Engineer. Her passion for Science, Technology and Engineering is ever-growing and for more than six years now she has focused it in the field of Engineering Management. She is in love with Mathematics and Engineering, so much so that she is fond of creating graphs & analyses on Excel! 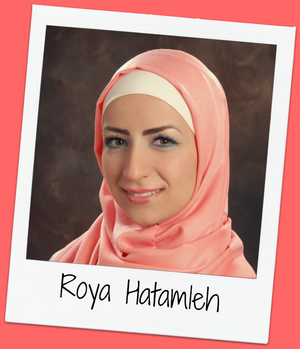 Ro'ya Hatamleh is one of our Project Coordinators for g4g Jordan. She is a communications engineer and a team leader at Estarta - Cisco TAC. She loves volunteering, especially when it comes to girls' futures! As a kid, she was AMAZED at how they could make science experiments just from a home kitchen! Since then she's been highly attached to everyday science and engineering.